Kent County Council in the UK is building a new section of road on the outskirts of Sittingbourne in south east England, which is aimed at removing congestion in the town centre and improving access to the existing Eurolink Business Park and East Hall Farm housing estate. Consulting engineer Jacobs designed the scheme and is also supervising the construction for Kent County Council, which let the main US$26 million civil works contract to Jackson Civil Engineering. The single carriageway Sittingbourne Northern Relief Road will link and connect to the existing Swale Way distributor road that joins the A249 dual carriageway to the north of the town and to the existing Eurolink and East Hall Farm road to the south. It is scheduled to open towards the end of 2011 and is part of the overall Sittingbourne relief road project which will bypass the town centre and eventually link the A249 and main A2 trunk road. The new 1.4km-long road starts at the existing Castle Road roundabout on Swale Way and travels north a short distance to a 106m-long, three span steel and concrete composite bridge over Milton Creek and on to an embankment. This crosses a disused landfill site to another shorter, but similar composite steel and concrete 41m-long single span bridge over the Sittingbourne and Kemsley narrow gauge light railway. It continues on an embankment across the low-lying Kemsley Marsh flood plain, before dropping down and linking into Swale Way at the Ridham Avenue roundabout. The southern section of the embankment, across the landfill, and a short length adjacent to the railway crossing on the northern section across the flood plain, require support on a grid of driven displacement concrete piles. About 1,500 precast concrete piles support these two sections of the embankment and transfer the load to the underlying sands and gravels. Jackson, which started on its two-year contract towards the end of 2009, awarded Aarsleff Piling an approximate US$1.2 million contract to supply and install the 350mm square section piles. The piling contract also included some trial piling and static and dynamic load testing to confirm and corroborate Jacobs’ design. Testing revealed that some longer piles up to 17.5m were needed across part of the landfill area to achieve the required 800kN compressive working load. These piles incorporate mechanical joints and are made up of under-piles with pin-jointed over-piles to the required length at each location. Aarsleff’s subsidiary Centrum Pile, which supplied all the contract’s precast concrete piles, is believed to be the only pile manufacturer in the UK able to produce precast concrete piles more than 15m long with mechanical joints to the highest Class A, in compliance with the harmonised European Standard, BS EN12794:2005 Precast concrete products. Foundation piles. 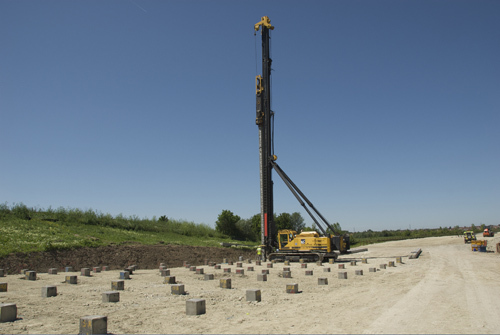 Aarsleff used two of its own piling rigs on the project with the smaller Banut 700, equipped with a free fall drop weight, working on part of the northern section of the embankment. It had to drive about 240 of the shorter piles, all 11.5m long and predominantly in rows of 23 on an approximate 2m grid. The company’s largest Junttan PM26 LC worked on the southern section installing around 1,250 of the longer piles up to 17.5m. These are in rows of seven and on a larger 3m grid pattern. The PM26LC, with accelerated impact hammer, has an adjustable stroke of up to 1.2m. It is operated from the rig’s hydraulic system and hydraulically accelerates the drop weight during the fall, boosting the impact energy and increasing by up to 20% the efficiency at full stroke over a conventional free fall drop hammer of the same weight. The hammer with its heaviest 9t weight produces maximum impact energy of 106kNm at full stroke. Impact energy, stroke and blow rate can be infinitely adjusted by the rig operator to suit ground conditions and pile type, as the accelerated hammer is suitable for driving all types of precast concrete, steel tube, sheet and timber piles. On completion of Aarsleff’s piling contract, Jackson followed on trimming the piles to length and tying them into individual 900mm and 600mm square, 300mm deep cast insitu pile caps. These will then be overlaid and linked with a bidirectional geotextile blanket to accommodate the initial load platform, prior to building up and completing the embankments in a series of layers to road level.